Anacortes /ˌænəˈkɔːrtəs/ is a city in Skagit County, Washington, United States. The name "Anacortes" is a consolidation of the name Anna Curtis, who was the wife of early Fidalgo Island settler Amos Bowman. 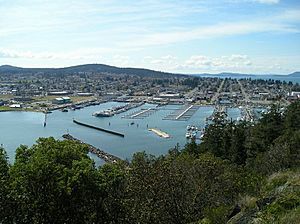 Anacortes' population was 15,778 at the time of the 2010 census. It is one of two principal cities of and included in the Mount Vernon-Anacortes Metropolitan Statistical Area. Anacortes is known for the Washington State Ferries dock and terminal serving Lopez Island, Shaw Island, Orcas Island, and San Juan Island, as well as Victoria, British Columbia (via Sidney, British Columbia) on Vancouver Island. There is also a Skagit County-operated ferry that serves Guemes Island, a residential island located across Guemes Channel, north of Anacortes. Anacortes was officially incorporated on May 19, 1891. In 1877, railroad surveyor and town founder Amos Bowman moved his family to the northern tip of Fidalgo Island. Bowman began promoting the area as an obvious terminus for the Northern Pacific Railroad as it was built through the north Cascades to the Pacific. Bowman established the town's first newspaper, The Northwest Enterprise, to promote his vision of the New York of the West. Seattle and Northern Company began building a rail line from the town in 1888. Real estate and development boomed from 1888 to 1890 as a result of the railroad rumors, and the Oregon Improvement Company posted $15 million in bonds to develop the town. In 1891, the real estate bubble burst. Speculators lost money and the Oregon Improvement Company could no longer afford to complete tracks over the Cascades. The town failed to become the railroad terminus Bowman had envisioned. After the bust, the town became prominent for its fishing tradition, thriving canning industry, and timber mills. Anacortes is on Fidalgo Island. According to the United States Census Bureau, the city has a total area of 15.53 square miles (40.22 km2), of which 11.75 square miles (30.43 km2) is land and 3.78 square miles (9.79 km2) is water. According to the Köppen climate classification system, Anacortes has a warm-summer Mediterranean climate (Csb). As of the census of 2010, there were 15,778 people, 6,980 households, and 4,461 families residing in the city. The population density was 1,342.8 inhabitants per square mile (518.5/km2). There were 7,680 housing units at an average density of 653.6 per square mile (252.4/km2). The racial makeup of the city was 91.5% White, 0.7% African American, 1.0% Native American, 1.9% Asian, 0.1% Pacific Islander, 1.6% from other races, and 3.3% from two or more races. Hispanic or Latino of any race were 5.0% of the population. There were 6,980 households of which 24.3% had children under the age of 18 living with them, 51.5% were married couples living together, 9.0% had a female householder with no husband present, 3.5% had a male householder with no wife present, and 36.1% were non-families. 29.5% of all households were made up of individuals and 14.3% had someone living alone who was 65 years of age or older. The average household size was 2.25 and the average family size was 2.75. The median age in the city was 47.2 years. 19.6% of residents were under the age of 18; 6.3% were between the ages of 18 and 24; 21.4% were from 25 to 44; 29.9% were from 45 to 64; and 22.9% were 65 years of age or older. The gender makeup of the city was 47.9% male and 52.1% female. Anacortes is on Fidalgo Island. It is surrounded by the north Puget Sound and San Juan Islands on three sides, and by the Swinomish Channel and the flats of Skagit Valley to the east. The weather is milder than other areas of the Pacific Northwest, because it lies within the Olympic Mountain rain shadow. Fidalgo Island gets 21 inches of rain per year, only half as much as Seattle. First known as Ship Harbor, Anacortes was established with a name and a post office in 1879 in the vain hope that it would be selected as the western terminus of the transcontinental railroad. The town was officially incorporated in 1891 shortly after the railroad bust, and became a lumber and fishing center. In the 1950s oil companies built big refineries near town. Two of the five refineries in Washington are located near the town. One is owned and operated by Tesoro (originally built and owned by Shell Oil), the Tesoro Anacortes Refinery, the other is owned and operated by Shell Puget Sound Refinery Company (originally built and owned by Texaco). Refining remains the area's largest industry, but the economic base now includes yacht construction/shipbuilding, tourism, and residential services for the nearby Whidbey Island Naval Air Station. Anacortes is a popular destination for boaters and those traveling on to the San Juan Islands. The city maintains a 220-acre (0.89 km2) city park on the northwestern end of Fidalgo Island named "Washington Park". This park features camping, boat launching, and majestic views of the San Juan Islands. The most prominent view is of Cypress Island. As a result of Anacortes' proximity to the Strait of Juan de Fuca, the area provides opportunities for whale-watching. The waters off of Anacortes and Fidalgo Island offer numerous varieties of marine-life, including three resident Orca pods. Anacortes Community Forest Lands, 2,800 acres (11 km2) with 50 miles (80 km) of mountain biking and hiking trails, are a rare amenity in a city the size of Anacortes. In adjacent Mount Erie Park, a number of rock climbing routes are popular on the cliffs of the south and west faces of Mount Erie. Mount Erie offers scenic vistas from its 1273-foot peak. Anacortes hosts many long-distance cyclists, as it is the western terminus of the Adventure Cycling Association's Northern Tier cross-country bicycle route, which ends in Bar Harbor, Maine. "Shipwreck Day" is a popular single-day, flea market/town garage sale event held annually on the 3rd Saturday in July. City management accommodates the occasion by blocking off several downtown streets. What the Heck Fest was an annual festival coinciding with Shipwreck Day. It began in 2001 and held its last festival in 2011. The festival took place at various locations all Anacortes in a week in the middle of July. Performers presented music, movies, literature, and art. The thematic center of the festival is the dinner show that includes a full meal along with the concert, an actual community event. The first weekend of August hosts the Anacortes Arts Festival. Started in 1962 as the result of the efforts of a group of dedicated community arts patrons, the festival is held in the midst of blocked-off downtown main street areas. Vendors, merchants, and artisans present their wares in covered booths while jazz and blues musicians are showcased on four different stages. The Oyster Run is an annual one day biker-friendly motorcycle rally held on the fourth Sunday of September. Beginning in 1981, the event has grown into the largest rally in the Pacific Northwest, with an estimated motorcycle count of 15000 bikes, and growing in numbers each year. Anacortes, Washington Facts for Kids. Kiddle Encyclopedia.